If you suffer with dry, gritty, watery or sore eyes, our BlephEx treatment can help to make your eyes feel more comfortable and get rid of any dry or flaky debris that may have built up in your eyelashes or in the corners of your eyes. The BlephEx treatment is designed to give your eyelids a thorough clean, removing debris from the lash line, reducing the inflammation and improving your overall eyelid health. BlephEx treatment and two products £65. 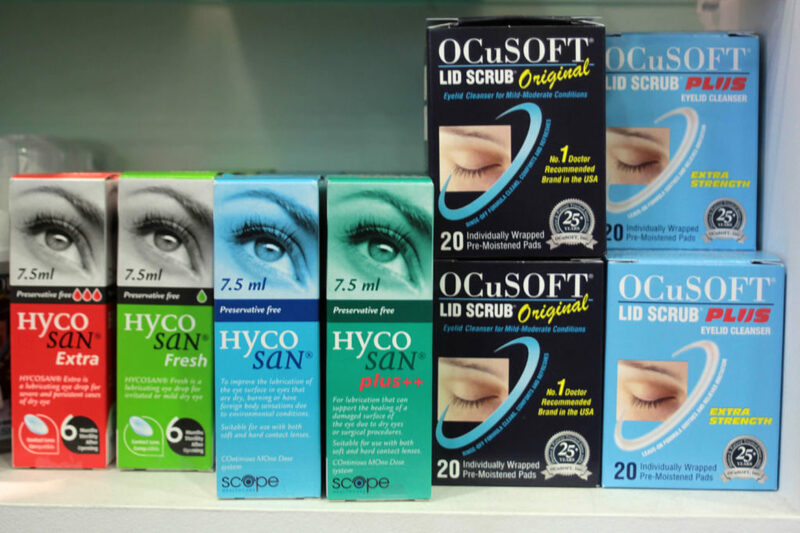 The product choices are a pack of 20 lid wipes and either an Optase Eyebag or Hycosan Eyedrops. A BlephEx treatment session lasts roughly half an hour beginning with one of our optometrists having a look at your eyes and taking a ‘before’ photograph of your eyelids. This is then followed by wearing a pair of goggles which will gently emit warm heat onto your eyes for 10 minutes, the heat helps to gently loosen and debris from the eyelids and eyelashes. After your lids are wiped, the optometrist with then clean your eyelids with a gentle scrub removing any debris that may be left on your lashes. One final wipe and your eyes should feel clean and fresh. An ‘after’ photograph will be taken of your lids showing you a comparison of your eyes before and after the treatment. It is important to maintain your treatment aftercare with the use of lid wipes, eye drops and heat mask, all of which we stock in at the practice. It is also recommended that you repeat the treatment every 4-6 months or as frequently as required. For more information on Blepharitis and the BlephEx treatment click here.